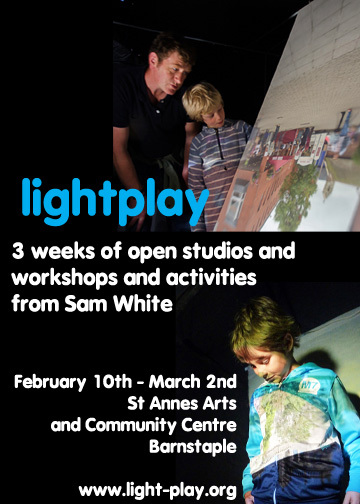 I’m very pleased and excited to announce an upcoming residency at St Annes Arts and Community Centre, in Barnstaple. To see some pictures from the last visit, click here! I can’t wait to work in such a beautiful building – my head is bursting with things I want to try during my time there, especially as I also have been offered lighting support from South West Lighting Solutions. Workshops with local schools – using the camera obscura and other creative uses of light to help inspire and create. In each workshop we will together create works to be exhibited publicly. To book, contact St Annes directly. Open workshops – an opportunity to come and see me at work. The obscura, lucida and other contraptions will be on show so come and ask me questions and have a go yourself. I will also be working on my latest project, aiming to get the camera obscura to directly record the light directly using light sensitive paper. I’ll be experimenting with different techniques and emulsions. Drop in Sessions – come and be photographed by my camera obscura, or see try drawing the beautiful building using a camera obscura or Lucida – drawing aids popular with the Victorians! Dates and details of these open activities will be announced shortly, but scroll down for a flavour of what you can expect..